Northwest Florida has some of the most beautiful beaches in the world, all lapped by startlingly clear, emerald-green waters. This is a whole different side of Florida. The side of quiet pleasures and fascinating surprises, with a colorful history, family attractions, down-home cookin', unique little shops, and friendly people with Southern accents. And it's a side of Florida that will stay with you long after you return home. Begin your day with a half-day fishing trip, dolphin cruise or sailing adventure and be soothed by the emerald-green waters of the Gulf. Venture over to The Boardwalk on Okaloosa Island where you can lunch on fresh Gulf-to-table seafood with beachfront views of the sugar-white sand and the Okaloosa Fishing Pier. In the afternoon, stroll downtown Fort Walton Beach's Heritage Park and Cultural Center, comprised of the Indian Temple Mound, 1912 Camp Walton Schoolhouse and Garnier Post Office Museum. Authentic Florida thrives in quiet coastal communities like Apalachicola, St. George Island, Carrabelle, Eastpoint and Alligator Point. Enjoy quiet, pet-friendly beaches on St. George Island and Alligator Point. Climb historic lighthouses. Camp, paddle or hike along wooded trails and quiet sloughs. Watch commercial fishing boats unload their daily catch or charter a trip with an oyster fisherman to learn how to catch your own. Explore the area's historic charm, boutiques, galleries and museums. End with fresh local seafood served at more than 30 area restaurants and seafood markets. At Zen Garden or Finn's Island Style Grub, start your day with gourmet coffee and a yoga session or a quick surf check. From there, explore 27 miles of beautiful beaches. Try snor-keling or paddleboarding at St. Andrews State Park, or catch a boat to Shell Island, a seven-mile-long natural barrier island. Explore diving history at the Man in the Sea Museum, before shopping at Pier Park. Catch the sunset from Schooner's restaurant, where the nightly event is celebrated with a cannon blast! Enjoy the sugar-white sandy beaches of Santa Rosa County. Fish from the Navarre Beach Pier (Gulf of Mexico's longest) or visit the Gulf Breeze Zoo, Navarre Beach Marine Science Station or Navarre Beach Sea Turtle Conservation Center. Tour Coldwater Gardens near Milton. 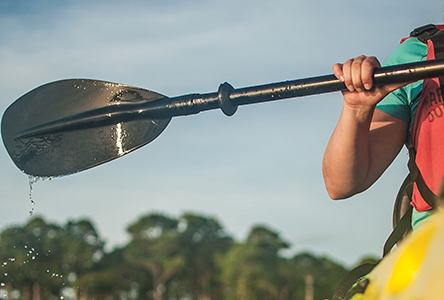 See why this part of Florida is known as the Canoe Capital of Florida with Adventures Unlimited. Canoe, kayak and tube along Coldwater Creek past secluded sandbars, through the pristine ecosystem of Blackwater River State Forest, or soar on its zip line canopy tour. In Franklin County, easternmost in the Panhandle, Apalachicola is the best-known city. Once the third-largest port on the Gulf of Mexico, reminders of those halcyon days of steamers and schooners, railroads and lumber mills remain. The city's historic district has nearly a thousand historic buildings and sites from a bygone era. Along the waterfront, structures that once served as commercial fishing factories and warehouses have evolved into seafood houses and galleries, and old shrimp boats now reside for eternity. Nearby Cape St. George Lighthouse had been lighting the way for mariners since 1852, until it collapsed into the water in 2005. Now it's been rebuilt with a new museum. It's no longer a working lighthouse (blame GPS), but you can't tell the story of this region without relating the history of this structure. Panama City has four very interesting neighborhoods in which to roam. Downtown is filled with galleries and arts facilities such as the Martin Theatre, the City Marina, the Visual Arts Center and the CityArts Cooperative. Historic St. Andrews still resembles the quaint fishing village it was in the "old days." Downtown North serves as the cultural hub of Panama City's African American community and Millville is named for its once-thriving paper-manufacturing and shipbuilding industries. Holmes County has a population of only 20,000, however it boasts one noteworthy historic residence. The Keith Cabin is an authentic 19th-century rural homestead on which William Thomas Keith grew cotton and tobacco . . . and expanded his land holdings from 10 acres to 190. The Beaches of South Walton are home to a vibrant arts community, anchored by the local Cultural Arts Alliance, and enhanced by the opening of the Foster Gallery in 2016. Every month, the vibrantly colored community of Seaside holds the First Friday Ruskin Place Art Walk, featuring live music, hors d'oeuvres and wine in the largest collection of art galleries on the Northwest Florida Gulf coast. Artists at Gulf Place is an art cooperative including potters, sculptors, painters, metal artists, candlemakers, photographers, folk artists and furniture-crafters, with workshops for kids. South Walton also boasts the Seaside Repertory Theatre, one of Northwest Florida's premier professional theater companies. At the Indian Temple Mound Museum in Fort Walton Beach, you can walk through 12,000 years of Native American life and admire one of the finest collections of prehistoric ceramics in the southeastern US. A short drive north of Fort Walton Beach, a more recent period of history comes alive at the Air Force Armament Museum, which takes you from the early biplanes of World War I to the SR-71 Blackbird-the fastest aircraft ever built. If Broadway shows and the Northwest Florida Symphony pique your interest, check the schedule at the Mattie Kelly Arts Center. At the western end of the Panhandle, the city of Pensacola boasts two significant distinctions. It was the first settlement founded by immigrants to America (although later deserted for a few years, thereby ceding to St. Augustine the title of first permanent settlement). And this city of only 52,000 is one of the few in the US with five professional performing arts companies. Pensacola's iconic Saenger Theatre first opened its doors in 1925, and is now restored to her original glory, hosting dance and musical companies, theater and a Classic Movie Series. Franklin County's attractions highlight its natural beauty, such as the Apalachicola National Forest and the Apalachicola National Estuarine Research Reserve, complete with fish tanks and interactive displays. A long time ago, a Liberty County resident named E.E. Callaway claimed he had found the Garden of Eden in Liberty County. Maybe, maybe not. But the county does have a part of paradise in its share of the Apalachicola National Forest. It also has the Veterans Memorial Railroad's three historic trains-one of them with a coal-fired steam engine. And at the Panhandle Pioneer Settlement, in neighboring Calhoun County, the way it was, is the way it is. No visit to Northwest Florida should end without a horseback ride on the beach, particularly in dream-like spots such as Cape San Blas. If you prefer your water inland (with oars or on a tour boat), head for the Dead Lakes, a unique ecosystem that's part-swamp, part-river, part-lake, and all pristine wilderness. In Panama City Beach, the Man in the Sea Museum covers the history of diving and the Navy's "Man in the Sea Program," which showcases SEALAB I, the Navy's first-ever underwater habitat. Panama City, too, lives on the water. Ashley Gorman Shell Island Cruises take you out to snorkel with the dolphins. And the Betsy Ann Riverboat, one of America's last remaining sternwheel paddlers, will take you for a trip back in time with a crew in period costumes and themed dinners such as Murder Mystery and Live Blues. The Beaches of South Walton have family fun spots like the Seacrest Wolf Preserve, where you can interact not only with wolves, but also with foxes, raccoons, skunks and Pecos the Coyote. At the E.O. Wilson Biophilia Center, there's a working beehive, a birdwatching station, a rescued snapping turtle, and several species of snakes and frogs. The Destin/Fort Walton Beach/Okaloosa Island area, also known as the Heart of the Emerald Coast, offers attractions such as the Gulfarium, where you can frolic in the water with rays and spend time observing dolphins. If your kids love dinosaurs, head for Wild Willy's Adventure Zone, with mini-golf, a trampoline, laser maze, arcade, incredible 4-D movie theater, and, yes, dinosaurs. Santa Rosa County's Gulf Breeze Zoo showcases over 50 acres of animals from around the world, and the Navarre Beach Marine Science Station combines hands-on learning and entertainment. In Escambia County, historical Pensacola Village is the site of the original Spanish and British forts in a city over which five flags have flown. In the Pensacola Lighthouse, built in 1859, climb the 177 steps for a dramatic panoramic view of the Gulf coast. Florida Panhandle beaches are world-renowned. You can play on more than 227 miles of them. White, fine-grained, sugar-sand beaches stretch from Apalachicola in the east to Pensacola in the west. And often, they're so uncrowded that you may come to think of them as your own private beaches! The Apalachicola National Forest proffers 564,000 acres of camping, picnicking, hiking, biking, boating, hunting and fishing. Inside this silent green wonderland lies the Fort Gadsden Historic Site, interpreting the history of Native and African Americans in this region during the early 1800s. Offshore, St. Vincent National Wildlife Refuge is a 12,492-acre barrier island accessible only by boat; the only residents you'll see are nesting bald eagles and loggerhead sea turtles, and, if you're lucky, a red wolf. If you're looking for the most spectacular sunsets you've ever seen, head for St. Joe Beach and Beacon Hill. Here, a shoreline leading to the horizon offers million-dollar views of the Gulf sun, blazing with color as it sets behind the silhouette of St. Joseph Peninsula. From there, it's a short drive to Panama City Beach where outdoor enthusiasts can hike and birdwatch along scenic trails, camp along the shore, enjoy unparalleled boating, fishing and diving, take kayaking tours, go off-road cycling, try stand-up paddleboarding and more. And, with everything from airboat adventures to glass-bottom boat tours and marine rescue programs, there are many ways to experience and observe the surrounding wildlife. At the newly opened 2,900-acre Panama City Beach Conservation Park, visitors enjoy boardwalks and 24 miles of unpaved trails, which are connected with other trail systems known as Gayle's Trails through the beach area. On the eastern edge of Panama City Beach, St. Andrews State Park is ranked among the top 10 beaches in the US and is one of the most popular outdoor recreation spots in Florida. Across from the mainland, Shell Island is a peaceful spot to relax or snorkel and the area surrounding the island is home to one of the largest concentrations of bottlenose dolphins in the country. Shuttle boat service to the island is available during the spring and summer months. Other locations worth checking out include Pine Log & Point Washing State Forests, Camp Helen State Park and the Florida Trail at Econfina Creek. Gulf Islands National Seashore is one gigantic playground, which includes the barrier islands of Pensacola Beach, Perdido Key and Okaloosa Island. Among the best beaches in Northwest Florida is the pristine five-mile stretch along the charming little town of Mexico Beach, where the beach consists of fine, white quartz crystals, which give the water its gem-like color. Then there's the Emerald Coast, voted "No. 1 Beach in the South" for 14 consecutive years. Heading inland, Florida Caverns State Park is home to the only guided dry cave tours in the state. Nearby is the Bellamy Bridge, said to be haunted by—who else?—the Ghost of Bellamy Bridge. Visitors in this area enjoy paddling, birdwatching, hiking, horseback riding, and some of the best bass fishing in the state. For an incredible cave-diving experience, check out Cave Adventurers to book dive lessons or trips at Merritt's Mill Pond. If you're talkin' Florida Panhandle cookin', you're talkin' fresh seafood. One of the best places to find it is in the town of Eastpoint, across the bay from Apalachicola and St. George Island. Eastpoint is lined with rustic seafood houses, serving freshly harvested Apalachicola Bay oysters just hauled in by the weathered skiffs outside. And the oysters come with an extra dose of friendliness as many of these restaurants are now into the fourth generation of family ownership. Panama City offers a variety of nightlife options, among them the multi-venue musical jam called "Music Matters." The Corner Pocket is a non-smoking pool hall with the largest selection of craft beer and the county's only owner-operated Cicerone establishment. The Place Downtown in the historic district of Panama City features karaoke and trivia nights and hosts performers from the Ukulele Orchestra and the Gulf Jazz Society. Neighboring Panama City Beach is a flip-flops town during the day however, when the sun goes down, its partying side comes out. Tootsie's Orchid Lounge is a branch of Nashville's world-famous honky-tonk, and Club La Vela is actually the largest nightclub in America. You can hear live music at places like Spinnaker Beach Club and Pineapple Willie's. And keep your throat moist, because in this town, there's a good chance you'll be using it for karaoke at night. In the town of Bonifay, you can find good food and sports at Sam's Place, and pool tables and camaraderie at La Cue Billiards. Come fall, Hammack Farms & Corn Maze is the perfect family evening out. There's a five-acre corn maze, a mini-hay-bale maze for the kids, hayrides, pumpkin patch, petting zoo, a playground, and a down-home-fun atmosphere. The picturesque seaside town of Destin may bring back memories of that famous '50s song, Harbor Lights. HarborWalk Village and the Destin Harbor are the most romantic strolling spots in town, with great shopping and cool boutiques, galleries, family restaurants and attractions, bars and clubs, pub crawls, live music, and dancing amid those harbor lights and lapping waters. In Pensacola, nightlife often revolves around performing arts companies like the Pensacola Symphony Orchestra, Pensacola Opera, Pensacola Ballet and the Pensacola Little Theatre, the oldest continuously operating community theater in the southeastern US. The Seville Quarter is a huge venue offering seven rooms of nighttime entertainment, with DJs, pool tables, dance club, restaurants, live music and dueling pianos. And downtown's Palafox Street is an exciting strip lined with restaurants, bars and clubs. The town of Mexico Beach boasts some of the best side trips in Northwest Florida. The Dead Lakes State Recreation Area, 23 miles away, offers perhaps the best freshwater fishing in the state, along with unusual vistas due to the stumps and dead tree trunks sticking out of the water. Another "natural" day trip from Mexico Beach is St. Vincent National Wildlife Refuge, accessible only by water. Here, you'll see an incredible variety of wildlife, among them many species of birds, Sambar deer and the endangered red wolf. A good starting point is Indian Pass, an historic trading post and, supposedly, the site of Spanish buried treasure. South Walton has 16 beach neighborhoods that make for a beautiful drive along the coast. You'll drive along Scenic 30A through a variety of distinct neighborhood styles—so distinct, in fact, that you'll know when you're going from one town into another. The area's upscale aura is evidenced by its many artists and galleries, funky local boutiques, and farm-to-table dining philosophy. This route also offers numerous opportunities to kayak on coastal dune lakes, play golf at a PGA-quality course, and bike along the 18-mile Timpoochee Trail. The Chautaqua Vineyards & Winery is a nice day trip from the Emerald Coast. You can tour the winery and learn the ABCs of grape-growing, pruning, harvesting, crushing and bottling. You'll be able to taste some of the wines that have earned Chautauqua over 140 awards, from dry wines and southern favorites to sweet muscadine and blueberry. In the tiny Jackson County town of Graceville, you'll find the Service Drugstore, the oldest continuously operated pharmacy in Florida. There's a captivating old-time ambience here, with original apothecary cabinetry, hardwood floors and pressed-tin ceiling, not to mention the old-fashioned milkshakes, ice-cream floats and hand-dipped ice-cream cones whipped up at the 1950s soda fountain. Reid Avenue in Port St. Joe is a half-mile-long stroll back into the Old South. Outdoor gear? Books? Jewelry? Local pottery or artwork? Luxury spa treatment? It's all here, along with restaurants running the gamut from Italian and Southern to Chinese and Mexican. At the Salt Air Farmers' Market, on the first and third Saturdays from February through December, you can find clothing, antiques and timeless treasures along with the fresh produce. As you drive through the charming little town of Mexico Beach, you'll come to Frost Pottery Garden, with imported pottery, great kites for the beach, wind chimes, jewelry and local artwork. The Shell Shack offers gifts plucked from one of Florida's most beautiful beaches, and Toucan's gift shop features great gifts for the folks back home. The Little Village in Panama City has an offbeat collection of outdoor shops. At The Little Mustard Seed, wander through three stories overflowing with custom furniture, handmade soaps and lotions, jewelry, and a thousand items that have been revived, renewed and restored. Historic Downtown Panama City is home to the Elegant Endeavors Antique Emporium and Main Street Antiques, which have been featured on different shows. Every Saturday, head over to the St. Andrews Farmers' Market. While you're there, step aboard Just the Cook, a super cool food boat, which has been showcased on the Food Network as having one of the top 16 cooks in America. Across the water in Panama City Beach, Pier Park is an "outdoor shopping and lifestyle center" with a wide variety of items to buy, eat or ogle. The Market Shops, on the Beaches of South Walton, offer outdoor shopping accompanied by musicians and artists. In Rosemary Beach, a planned town built in the mid-90s on the principle of "New Urbanism" (much like its neighbor Seaside, which preceded it by 15 years), the French Quarter, with its balconies and vividly colored buildings and curling wrought-iron railings, is a delightful place to while away an afternoon shopping and dining. In Destin, HarborWalk Village has a vibrant atmosphere, with vendors, artists and street performers outside, and stunning views of the Gulf of Mexico and Choctawhatchee Bay. On The Boardwalk on Okaloosa Island, you'll find five restaurants and some shops. Nearby Fort Walton Beach is filled with boutiques, restaurants and galleries-even a brewery. Hunt for bargains at Silver Sands Premium Outlets in Miramar Beach and Destin Commons, and the Fort Walton Beach Antique/Flea Market District has treasures you never knew you needed until now. © 2018 Globelite Travel Marketing Inc.